Here are more holiday events in Toronto, Ontario, Canada. Holiday scheduling for outdoor rinks, indoor skating, ski, snowboard and swim programs will be in effect from December 24, 2013 to January 6, 2014. This is an update to the previous blog, You’re Invited: Celebratory Events in Montreal & Toronto Nov.29-Feb.23, 2014 + News & Alerts. Skating on outdoor artificial ice rinks is FREE for all ages. The official opening of the new rinks at Dieppe Park (located at 455 Cosburn Ave.) occurred on December 8, 2013. The existing rink slab was replaced; fences, dasher boards and the refrigeration were improved; new lighting was installed on the hockey ice pad and the leisure skating path; and new rubber flooring and benches were installed. The $2.4 million investment included interior and exterior renovations to the change room building in addition to modification and enhancement of the existing site landscape, asphalt and concrete sidewalks. Drop-in skating for adults only at indoor rinks costs $3.50 for adults and $1.75 for seniors. On December 25, outdoor rinks are unsupervised and for use at your own risk. Earl Bales Ski and Snowboard Centre, located at 4169 Bathurst St., is scheduled to open on Saturday, December 14 (weather permitting). Centennial Ski and Snowboard Centre, located at 256 Centennial Park Rd., is scheduled to open mid-December (weather permitting). Please click here for updated info. A variety of leisure swim programs are available at pools throughout the city. Please click here to check online since schedules vary by location. Visit the cows, horses, sheep, goats, rabbits and farm cats at Riverdale Farm, 201 Winchester St. The farm offers indoor board games, sewing crafts with the Cabbagetown Quilters Guild, and activities with the Toronto Guild of Spinners and Weavers. The farm is open daily, from 9 a.m. to 5 p.m.
You can call the farm at 416-392-6794 or check online at www.toronto.ca/parks/featured-parks for more information. Located at 77 Deer Pen Rd. in High Park, the High Park Zoo houses both domestic and exotic animals, including bison, llamas, peacocks, reindeer, highland cattle and sheep. The zoo is open daily from dawn to dusk. Located at Flemingdon Park Community Centre at 150 Grenoble Dr., Playground Paradise offers family fun for children 12 and younger. Kids can play on a two-storey play structure, go down the spiral slide, swing on the track ride, climb the cargo elevator, talk to friends through the talk tube and play in a ball pit with over 8,000 balls. The hours at the playground vary during the holiday season. Select “Drop-in Programs” and then select “General Interest” to get the most up-to-date schedule or call 416-395-6014. Regular scheduling returns on January 4, 2014. The daily rate is $2.50 per child. The two Christmas flower shows at City conservatories are a tradition marking the official start of the holiday season. Admission to both conservatories is FREE. Donations to the Daily Bread Food Bank are welcome. The Shared Path, the newest of the City of Toronto’s Discovery Walks, includes 15 kilometres of trails through a series of park areas along the banks of the Humber River. The Discovery Walks program is a series of 10 self-guided walks linking ravines, parks and neighbourhoods to showcase Toronto’s outstanding natural features and cultural and historical attractions. Please click here to discover the trails and download maps. December 24 and 31, 2013 – Community centres close at 4 p.m. except those with previously scheduled permits or exceptions. December 25 and 26, 2013 – Community centres are closed, except those offering special holiday drop-in programs. January 1, 2014 – Community centres are closed. For more information and program schedules, visit http://www.toronto.ca/parks or call 311. City staff at community centres can also provide their centre’s holiday schedules. Some centres may be closed for annual maintenance and repairs. Above, Rotunda. Photo: City of Toronto. Christmas Choral Concert at City Hall: December 24 at 11:30 a.m. The public is invited to take in the sounds of the season at the City of Toronto’s annual Christmas Choral Celebration. This FREE event will take place on in the rotunda at City Hall, 100 Queen St. W.
This year’s event will be hosted by Citytv’s Tammie Sutherland, and includes performances by All the King’s Voices, Toronto Beaches Children’s Chorus, Toronto Mass Choir, Tower Brass and organist James Bourne. There will also be a visit from Santa himself at the end of the concert. Please consider bringing a new, unwrapped toy for the Mayor’s Toy Drive. On New Year’s Eve, the Toronto Transit Commission will offer FREE, extended service from 7 p.m. on Dec. 31, 2013 to 7 a.m. on Jan. 1, 2014 thanks to a new, three-year partnership with Corby Spirit and Wine. Corby Spirit and Wine is paying the fare on all subways, streetcars and buses between 7 p.m. and 7 a.m. so you get home safe. Late night service will be extended on most routes. Last trains on the Bloor-Danforth line will leave Bloor-Yonge Station at 3:37 a.m. for Kipling Station and at 3:37 a.m. for Kennedy Station. Last train on the Sheppard line will leave Sheppard-Yonge Station at 3:58 a.m. for Don Mills Station. Subway starts at 9 a.m.
As outlined in TTC’s 2013 Customer Charter, Wi-Fi service is now available within two stations by the fourth quarter, in 2013. If you see the Wi-Fi Station sign at any of our stations, you will be able to connect your Wi-Fi enabled device (smartphone, tablet or laptop) to our TCONNECT network. To connect your device to the Wi-Fi network select the Wi-Fi network: TCONNECT within your device’s Wi-Fi setting. Once you select the network, open an Internet browser like Chrome for an Android device, Safari on an Apple device, Blackberry Browser on a Blackberry device or third party browsers like Opera or Firefox. Once the browser is opened you will see our welcome screen with instructions for access. There is no cost to connect within the TTC subway system; however, TCONNECT is ad-supported, meaning an advertiser is sponsoring the Wi-Fi service with short ads. Ad-supported Wi-Fi service allows us to provide this amenity at no cost to TTC riders. The installation of this service comes at no cost to the TTC, TTC riders or Toronto taxpayers. In fact, it will generate revenue for the TTC. Please note that there will not be Wi-Fi coverage between stations and in tunnels but as soon as the train enters the next Wi-Fi enabled station your device will automatically re-connect to the Internet. If you have questions or difficulty assessing the TCONNECT Wi-Fi network please send us a message at info@TCONNECT.ca or call our Help Desk at 416-777-WiFi (9434). Metro Hall, 55 John St. The toys, gifts and gift cards collected will be distributed through the CP24 CHUM Christmas Wish and the Global Television (Toronto) toy drives. Donations will help provide a festive Christmas for Toronto children and families who might not otherwise have one. All toy and gift donations are appreciated. There is typically a shortage of gifts for infants and teenagers. Gift cards for grocery and department stores help to make the holidays enjoyable for families who need assistance. Toronto Public Health congratulates the Government of Ontario and the Minister of Health for their announced introduction of the Ontario Temporary Health Program (OTHP) to begin on January 1, 2014. The new program will provide access to essential and urgent health care and medication coverage to refugees and refugee claimants living in Ontario, regardless of immigration status or country of origin. The OTHP is intended to fill the gap left by the federal government’s changes to the Interim Federal Health Program (IFHP) on June 30, 2012. “Refugees and refugee claimants are an already marginalized group who face health risks, barriers to access and in some cases poorer health outcomes and increased mortality than those born in Canada. I am pleased the provincial government has announced its program to help Ontario residents get access to urgent, essential services and medication to improve their health. Please click here to read the Toronto Public Health’s Board of Health report advocating for the restoration of the IFHP (pdf). More information about OTHP is available at http://news.ontario.ca/mohltc/en/2013/12/ontario-temporary-health-program.html. Twin Tunnelling Completed for Toronto-York Spadina Subway Extension! TTC provides an inside look at the final stages of tunnelling for the Toronto-York Spadina Subway Extension project. Another milestone, as tunnelling is now complete for the Toronto-York Spadina Subway Extension. The extension will open in late fall 2016. The R.C. Harris Water Treatment Plant, located at the foot of Victoria Park Avenue, has been recognized as a Canadian Water Landmark by the American Water Works Association. The purpose of the award is to recognize and preserve a North American Water Landmark at least 50 years old that has had a direct and significant relationship with water supply, treatment and distribution. The R.C. Harris, fashioned in the Art Deco style, is the largest and most ornate of Toronto’s four water treatment plants. It was one of the 137 places listed for Toronto Doors 2011. The plant, which was constructed in the 1930s, treats an average of 453 million litres of water a day. The City of Toronto’s 12 Strays of Christmas is an animal adoption event whereby these strays and many others are available for adoption at one of Toronto’s four shelters, as well as at adoption partner locations. Toronto Animal Services Shelters: Open seven days a week from 10:30 a.m. to 6:30 p.m.
South Region – 140 Princes’ Blvd., Exhibition Place, Horse Palace. Toronto Animal Services partners with a number of retailers in Toronto to adopt out pets. A link to a list of all adoption partners is located on the “Adopt-A-Pet” section of the City’s website. 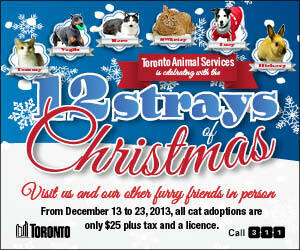 The 12 Strays of Christmas features three animals from each of the four City of Toronto shelters. You can view the 12 strays (and all the other animals up for adoption) at http://www.toronto.ca/animalservices. From December 13 to December 23, all cat adoptions are just $25 (a saving of almost $50) plus tax and a licence. Adoption rates for all other animals remain unchanged. Please click here for a list of all adoption rates. Toronto residents are required to purchase a licence for all cats and dogs in Toronto, In accordance with Toronto Municipal Code, Chapter 349. Licences for sterilized cats are $15 ($7.50 for seniors). Licences for sterilized dogs are $25 ($12.50 for seniors). Toronto residents can now purchase or renew their dog or cat licence at the Toronto Humane Society and participating veterinarians across the city. Licences will still be sold at the four Toronto Animal Services’ shelters and on the City’s website through the e-Pet portal. Recent estimates show that only 30 per cent of dogs and 10 per cent of cats in the City of Toronto are licensed. Through pet licensing, Animal Services makes every effort to reunite owners with their pet if it becomes accidentally lost or in the case of an emergency, 24 hours a day, 7 days a week, 365 days per year. Licensing fees go directly back to Toronto Animal Services to help support programs such as pet adoption, spaying/neutering and providing medical care for lost and homeless animals. For anyone unable to adopt a pet but who wants to contribute to an improved life for these animals, a donation can be made on the website or in person at any one of the shelters. Torontonians may also drop off a holiday gift for the animals, who are always in need of blankets and towels (new or used), cat treats, dog cookies, leashes, collars and halti-leads, toys, hot water bottles and can openers. Pedestrians will not be able to cross Toronto’s Dufferin Street Bridge until January as a result of complications to construction work taking place at the site. Pedestrians can cross the railway tracks between Liberty Village and Exhibition Place, using the GO Station tunnel at Atlantic Avenue. Also, the bridge will be closed to vehicular traffic until February, when two temporary bridges will be installed. On December 2, the Toronto Building Division began accepting email submissions for customers seeking building permits and making building service requests. This new service option for submitting a service request is part of the division’s Electronic Service Delivery Program. Residents and businesses are now able to submit applications for a number of building, mechanical and plumbing permits by email.A complete listing of Toronto Building services along with submission requirements is available on the Toronto Building webpage. In addition, customers can now apply at any Toronto Building Customer Service counter to make an application for any of these services. If applying in person, a rewritable DVD containing all the necessary materials for the eligible service requests will be required. No paper copies are required for applications eligible for this program. Toronto Building has also expanded the list of projects eligible for the Residential FASTRACK Program, an enhanced building permit service for certain types of projects in existing houses containing one or two dwelling units. Eligible applications are typically reviewed within five business days. Please click here for a list of projectsthat are now eligible for Residential FASTRACK. More information is available at http://www.toronto.ca/building. Please complete a short survey about bus stop and shelter map redesign. The survey will take no more than 10 minutes of your time and your responses will be completely anonymous. TTC strongly encourages you to refer to this Wellesley Shelter Map (pdf). Please note that this PDF will open in a separate window so that you you can magnify the image and refer to it while taking the bus stop and shelter map redesign survey. The health impacts of traffic-related air pollution cost nearly $2 billion a year. Physical inactivity and obesity cost the Greater Toronto and Hamilton Area about $4 billion a year in direct health care costs and indirect costs such as lost productivity. A comprehensive transportation system would greatly reduce these costs. On December 12, 2013, Bill 105 Supporting Small Businesses Act 2013 passed final vote with all party support. The changes mean 88 per cent of private-sector employers in Ontario will now be exempt from paying the Employer Health Tax. The exemption will increase from $400,000 to $450,000 of Ontario payroll, saving most employers up to $975 every year. This change will cut costs and reduce paperwork for businesses so they can reinvest in their company or hire more staff. Over 60,000 smaller employers would pay less EHT, including more than 12,000 employers that will no longer pay the tax, and would save the cost of filing an Employer Health Tax return. The exemption will be adjusted to inflation every five years. Private sector employers with annual payrolls over $5 million, including groups of associated employers, will lose the exemption. Registered charities with all payroll sizes will be able to continue to claim the exemption. The City of Toronto has called an Extreme Cold Weather Alert to make vulnerable homeless people in Toronto aware of the dangers of staying outside too long in cold weather and to ensure they have safe and warm places to go. The alert is in effect until further notice. An Extreme Cold Weather Alert is called to trigger additional homelessness services. Alerts are typically called in the morning for the coming overnight period so that community agencies have sufficient time to call in extra staff to provide enhanced services. • Shelters are directed to relax any existing service restrictions and are reminded that if a bed is not available at their site, they are to allow the client to stay at the shelter until they are able to find a bed for them elsewhere in the system. • The City of Toronto immediately adds 26 shelter spaces for men and women to the shelter spaces available to staff looking to refer a client to a shelter bed. • Overnight street outreach is increased in the downtown core, focusing solely on warning people of danger and urging them to get into a shelter or another warm, indoor place. Workers will transport people to warm places if necessary. • TTC tokens are available at some drop-ins so people can use public transit to get to shelters. • More than 100 agencies are advised of the oncoming extreme weather and asked to relax any service restrictions they may have. • Go in person to the Streets to Homes Assessment and Referral Centre, located at 129 Peter St. (at Richmond Street). If you see someone who you think requires street outreach assistance, call 311. Note that 311 is not an emergency number. In an emergency, dial 911.